Spider-Man’s vintage comic suit is the best thing in an already amazing Spider-Man game. There aren’t many bad things to say about PlayStation 4's Spider-Man game. The story is captivating, the graphics amazing, and the gameplay addictive. Yet there’s one thing that brings the game to another level. It’s the cherry on top of a delicious video game sundae. And that’s the vintage comic book suit. The vintage comic book suit is just one of almost three dozen different suits available in the game. To get it, you need to level up to 41 and exchange four Backpack Tokens, four Challenge Tokens, and four Crime Tokens to receive it. Basically, it’s not easy to get. It comes with the power of “Quips,” which damages an enemy’s pride, which isn’t exactly a powerful maneuver. Yet, in my mind, there is no better suit to have in the game. Why? Well, it just makes the whole game feel completely different. Nothing about the game changes, per se. It’s still just Spider-Man swinging around New York, beating up bad guys and solving crimes. But in the vintage comic book suit, you actually feel like you are watching a comic book, which is not something you can say about almost any modern comic book adaptation. Even $200 million comic book movies give their characters a more realistic suit. Something tactile. Something believable. This suit is not that. It sticks out like a sore thumb, blasting off the screen like a firework on a starless night. It’s bright, bold, and almost infuriatingly cartoonish in contrast with the rest of the game—and that’s what makes it so great. That looks like a sticker rather than a legitimate part of the game. In the suit, you are a living comic book panel. You aren’t just Spider-Man, you’re Spider-Man when Steve Ditko and Stan Lee created him. You don’t feel like you’re holding a controller; you feel like you’re holding a pencil, paper, and ink. It’s the purest classic version of Spider-Man we’ve seen in modern media, and watching a character with such a hand-drawn feel fly through the hyper-realistic game parallels the role of Spider-Man in his own comic book world. He’s the standout and outsider, the unmistakable hero swinging between the buildings. Yes, many of the other suits look awesome and do better things from a game standpoint, but none of those suits feel historic. None of them make a great video game about a comic book character feel like a tactile comic book. The vintage comic book suit does that and so much more. If you have the means, I highly recommend picking one up. In addition to the above photos, here are bunch of other vintage suit photos taken by our resident expert on pictures of Spider-Man, James Whitbrook. No explanations needed. 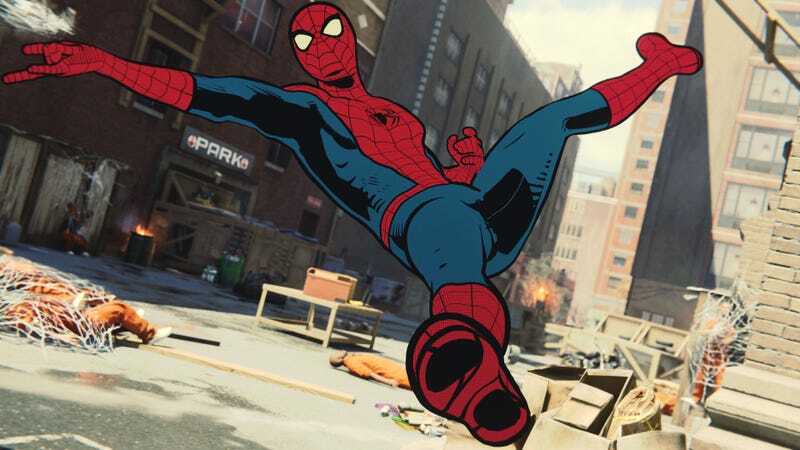 Here are a bunch of beautiful pictures of the vintage comic suit in PS4's Spider-Man.